View More In Carving Sets. 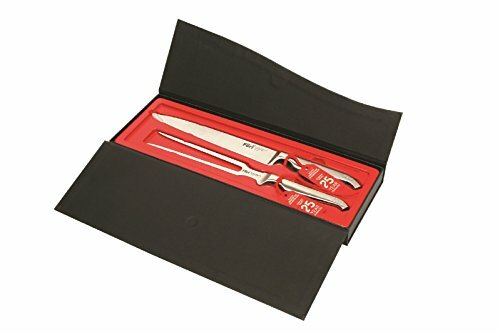 Designed for more than just a Sunday roast, the Furi Pro Carving Knife Set is perfect for Friday, Saturday or any day creations. A succulent salty crackling, delicate slow cooked lamb or BBQ Portuguese Chicken. Designed to hold with precision & ensure the smoothest of slices. Furi Knives designed and established in 1996 by leading Australian engineers and international chefs, has won respect, awards and popularity for its exceptional performance, designs and durability. Furi knives feature a seamless, all Japanese stainless steel construction. The smooth, seamless contours eliminate food and dirt traps for the ultimate in safety and hygiene. The blade is constructed from a high carbon stainless steel alloy that is different from typical German and modern Japanese blades because the alloy is not VrMoV based. Rather, it is high carbon and therefore tougher and easier to sharpen and also holds its edge a long time. Chefs and experienced knife users find it is more like carbon steel knives, but with corrosion resistance. Furi achieves a blade that is both strong and sharp by grinding carefully to very thin shoulders (for less cutting resistance), but with a strong cutting edge at 17 degrees (not 15). Our blades are the only ones that sit right in the middle between very sharp but fragile Japanese blades, and very strong but not so sharp German blades. The best practical combination possible for chefs. Developed for the professional chef; Furi knives are tough, weighty and more comfortable with a reverse wedge handle design that resists slip toward the blade. This leads to much less fatigue for heavy knife users (and less carpal tunnel/strain injuries, common to chefs). The bolster design allows the user to fully sharpen the knife to the blade heel while providing a comfortable finger rest. Furi Cutlery offer superior performance and comfort. 25 year guarantee, designed to last in the toughest kitchens. If you have any questions about this product by Furi Knives, contact us by completing and submitting the form below. If you are looking for a specif part number, please include it with your message.